A swimming pool in the garden is seen by many as a luxury item, but with our hot summers these days, it’s almost a necessity! 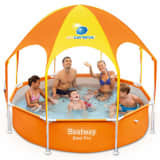 Nowadays, there are several above ground pool options that will bring you, your family and friends a lot of joy during the summer period. 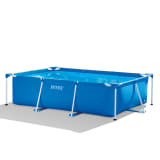 Here at vidaXL, you can find amazing large pools with frames which are quick and easy to setup, as well as inflatable ones for smaller spaces. So, what are you waiting for? 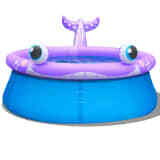 Come on in, find the perfect pool for you and get ready to cool down this summer! 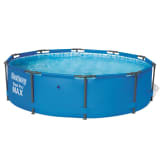 You can make a distinction between two kinds of above ground pools: pools with a frame, or inflatable pools. Both have their own pros and cons that we would like to point out. 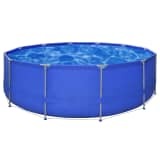 In comparison to inflatable pools, framed pools are often, more sturdy, larger and less prone to leaks. Because of their size people, often leave these pools standing in the garden throughout the entire summer. This is something to consider when choosing your perfect pool if space is an issue in your garden. 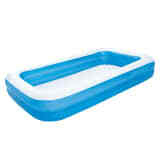 Inflatable pools are easier to set up, and to deflate when you no longer need them. 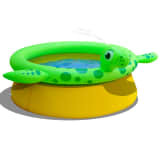 These pools also come in smaller sizes, which makes them more suitable for small children to play around in. 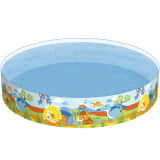 When you leave your pool outside for the entire summer, it’s important that you maintain it well. 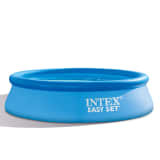 There are several pumps available that filter the water and keep it clear of any dirt that may accumulate. 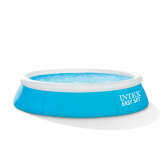 Other useful accessories are pool vacuums, pool covers, ladders and lighting. 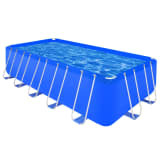 A popular addition for swimming pools is a heat exchanger. A heat exchanger will make sure the water is always at a comfortable temperature. 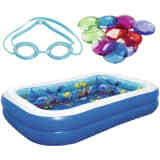 Here at vidaXL, you will find everything you need for your pool!